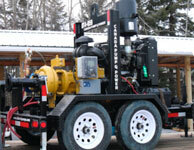 Mighty Pumps have set the standard for an Industrial Strength Pump. 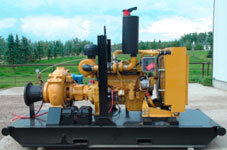 Mighty Jet-Prime Pumps utilize an air compressor to push air through a Venturi Jet which pulls a vacuum of 25″ of mg which allows these pumps to prime to a suction head of 28′. 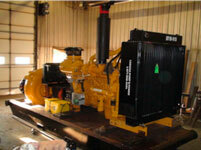 When you do not want the air compressor, you can turn it off with a quarter turn valve. 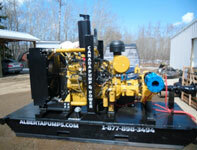 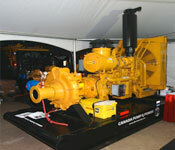 Run dry mechanical seals with huge oil reservoirs enable these pumps are able to run dry indefinitely. 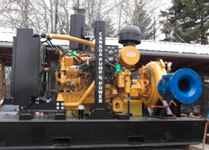 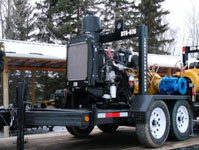 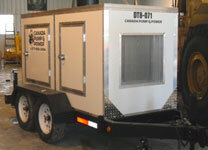 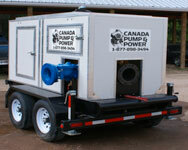 Mighty Jet-Pumps are built with Quiet Containers, and Industrial Strength Skids or Double Axle Heavy Duty Trailers.